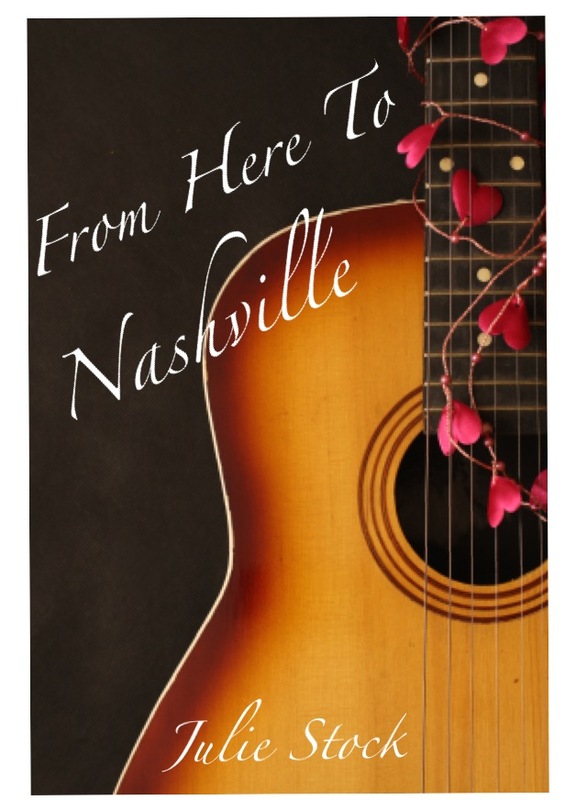 This week, I finally finished editing my manuscript of my debut novel, ‘From Here to Nashville,’ ready to send off to the Romantic Novelists’ Association to be assessed as part of their New Writers’ Scheme. As some of you will know, I originally started writing it in MS Word but when I ‘won’ Camp NaNoWriMo last July, I decided to buy Scrivener and I’ve been using it ever since. I love Scrivener and find it very flexible but there is so much to learn all the time. I recently managed to successfully export my second novel to my Kindle from Scrivener (see blog post here) but this week, I had to work out how to export my manuscript from Scrivener to Word. As it took me quite a few goes, I thought I would share some of the lessons I learned whilst doing it. It may sound obvious but the first thing I would recommend is to print out the notes about your template and read them. For example, I had chosen ‘Novel with Parts’ which generates a standard manuscript format for novels when compiled (File > Compile). I don’t usually read instructions, preferring to just dive in and learn whilst doing but how I wish I had read these instructions before I started labelling all the different parts of my novel. I had worked out that I would need a new folder for each chapter of my novel and I had set these up as direct subdocuments of the manuscript folder. As I don’t have chapter names, I then labelled them Chapter 1, Chapter 2 and so on. I also labelled many of them with a date as this is important to my story and I wrote the date within the relevant scene as well. What I didn’t realise was that the ‘Compile’ process automatically labels all the chapters too so on my first compile, I found that all my chapters were labelled twice and some had the date showing twice as well! With forty-four chapters, I did not want to have to go through and delete all that information. However, the notes do tell you that you can choose not to include these titles during the compile process. All I needed to do was to work out how. When you choose File > Compile, select ‘All Options’ at the top of the dialogue box and not ‘Summary.’ This will bring up a long list of options for you on the left-hand side. Choose ‘Formatting’ here and then select ‘Level 2+’ and make sure that ‘Text’ is selected for all the levels showing. You do not need to select ‘Title’. This means that the chapters will only be labelled once and any other labels you’ve included will only show up once. I would imagine that most people will have labelled their folders in a similar way to me in the Binder because otherwise, how do you know which chapter you’re on when you’re writing? If your chapters have a name, not a number, you might be OK but otherwise, it makes sense to label them with numbers. This is what mine looks like. Your title page is included in a folder right towards the bottom of your binder called ‘Front Matter.’ There are three options to choose from here. If you’re exporting to Word, then you need to choose ‘Manuscript Format’ and you will see that ‘Title Page’ comes up within that. Here, you can edit your title page to look exactly as you want it to. I had to make a few changes to mine to accommodate the RNA’s requirements and I don’t have an agent so I deleted those details too. This bit was all quite easy, thank goodness. The first few times I exported my manuscript, I didn’t realise that I was also including some folders of edits that I didn’t want to send. It took me a while to work out how to sort this out. When you have clicked on the ‘All Options’ tab, after choosing File > Compile, you will see that the first heading on the left is called ‘Contents.’ This is where you check the folders you want to include and uncheck the ones you don’t want to include. My other major problem was that the header was not what I wanted it to be at all. It had my surname in capitals, the title of my book and the page number. I wanted my full name, not in capitals and I wanted the page number to be at the bottom of the page instead. I left the title in the header as it was. To change the rest, click on ‘Page Settings’ in the selection of options on the left-hand side. It looks like this. In the third box along, under Header, I changed <$surname> to say <$fullname>, leaving all the other symbols as they were and I changed the case to lower case. I cut the page number information <$p> and pasted it into the middle box under Footer so that the page number would come up at the bottom of every page. I also changed the Header and Footer fonts here from Courier which I didn’t want. Finally, you will notice that just underneath where it says ‘All Options,’ in the File > Compile dialogue box, there is a drop-down menu which says ‘Format As’. When you first open up File > Compile, this is chosen for you but you should change it to ‘Custom’ if you make any changes to any of the options at the side. That way, whenever you go to do this process again, your settings will remain the same. I have written before about whether there is such a thing as too much advice. You can read that blog post here. There is no doubt that the internet is a wonderful research tool but sometimes, it is really difficult to see the wood for the trees. As you know, I finished reading my first draft aloud at the end of last year. Since then, I have been inputting those edits to my manuscript and now that I have finished, I have turned my attention to trying to write a synopsis in an effort to see where my plot-holes are. You may remember that I wrote my first draft as a ‘pantser’, which is why I now have plot-holes! I have got into the habit of bookmarking all the useful articles I read about writing so I can come back to them later and today, I decided that it was time for me to pick out all the articles I had found about how to write a good synopsis. There were at least a dozen articles in total when I started re-reading them, although I am sure there are many more out there. 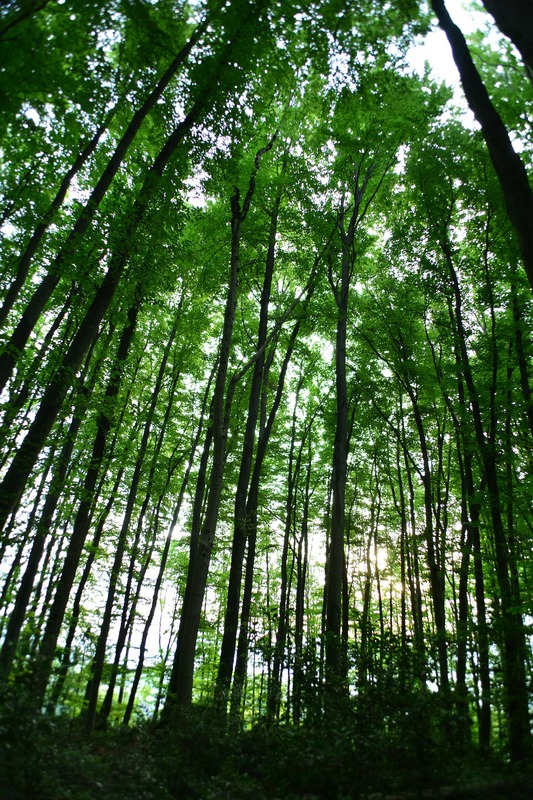 There may even be a whole wood 😉 I have read them all and distilled them down to the ones which I found to be the most helpful for me (the trees). I really would encourage you to read these three articles at least. Tune in next week to see how I got on 🙂 I hope you find these articles helpful but if you have a tried and tested method for writing a synopsis, please do let me know in the comments below. Thanks for reading. At last, I am editing and rewriting! Wow, I have finally broken the back of this in the past couple of days after a lot of procrastination. I started by importing my manuscript into Scrivener and then I split it up into parts, chapters and scenes. This took a bit of time but it also allowed me to move bits around much more easily and I knew I wanted to do this. I have also written a synopsis for each scene I have edited and/or rewritten and I have kept all the bits I have moved in a separate ‘scene’ to fit back in later. Perhaps I should explain that I had received a comment from an Authonomy friend that my two main characters fall in love a bit too quickly and after some thought, I agreed that this was probably true. I also felt that this might be part of the reason why I didn’t know how to finish the story. 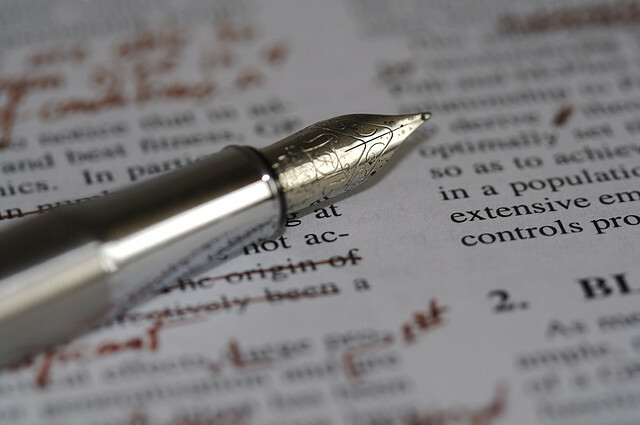 If you are putting off editing, using a software package like Scrivener can really take away that daunting feeling. I would recommend it and it’s such good value. The lesson I have learned from this though, is that I need to write my next book (! 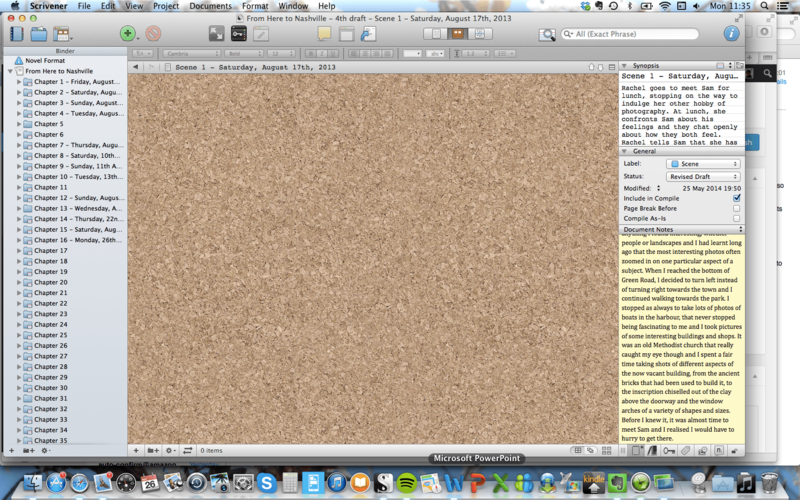 ), including an outline, in Scrivener first to save myself an awful lot of time.